The Bureau of Land Management (BLM) announces that the Wild Horse and Burro Advisory Board will conduct a meeting on matters pertaining to management and protection of wild, free-roaming horses and burros on the Nation’s public lands. The Advisory Board will meet on Wednesday April 22, 2015, from 8 a.m. to 5 p.m. Eastern Time and Thursday April 23, 2015, from 8:00 a.m. to 5:00 p.m. Eastern Time. This will be a two day meeting. Public comment is on the 22nd at 3 p.m. and written public comments may be submitted also for the Advisory Board. See detailed information below. This Advisory Board meeting will take place in Columbus, Ohio at the Hyatt Regency Columbus, 350 North High Street, Columbus, OH 43215, telephone 614-463-1234. Written comments pertaining to the April 22-23, 2015, Advisory Board meeting can be mailed to National Wild Horse and Burro Program,WO-260, Attention: Ramona DeLorme, 1340 Financial Boulevard, Reno, NV 89502-7147, or sent electronically to wildhorse@blm.gov. Please include “Advisory Board Comment” in the subject line of the email. Ramona DeLorme, Wild Horse and Burro Administrative Assistant, at 775-861-6583. Persons who use a telecommunications device for the deaf (TDD) may call the Federal Information Relay Service (FIRS) at 1-800-877-8339 to contact the above individual during normal business hours. The FIRS is available 24 hours a day, 7 days a week, to leave a message or question with the above individual. You will receive a reply during normal business hours. The meeting site is accessible to individuals with disabilities. An individual with a disability needing an auxiliary aid or service to participate in the meeting, such as an interpreting service, assistive listening device, or materials in an alternate format, must notify Ms. DeLorme two weeks before the scheduled meeting date. Although the BLM will attempt to meet a request received after that date, the requested auxiliary aid or service may not be available because of insufficient time to arrange for it. The Federal Advisory Committee Management Regulations at 41 CFR 101-6.1015(b), requires BLM to publish in the Federal Register notice of a public meeting 15 days prior to the meeting date. 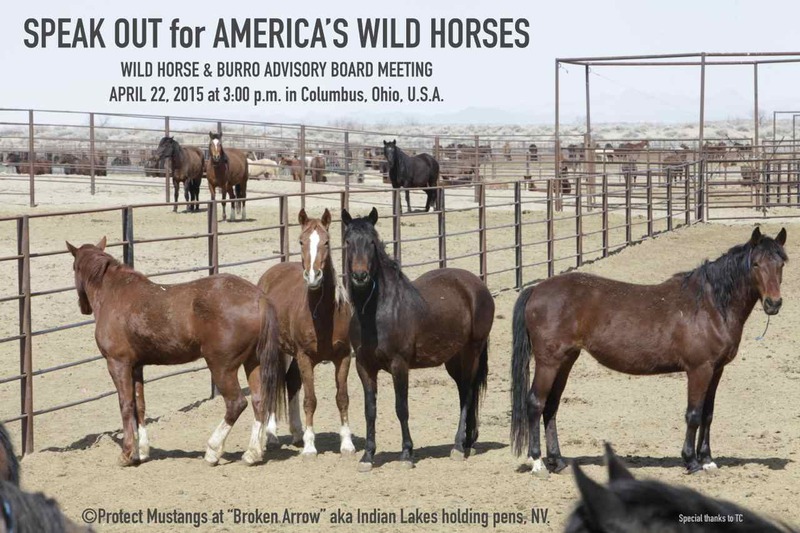 On Wednesday, April 22, 2015 at 3:00 p.m. members of the public will have the opportunity to make comments to the Advisory Board on the Wild Horse and Burro Program. Persons wishing to make comments during the meeting should register in person with the BLM by 2:00 p.m. on April 22, 2015, at the meeting location. Depending on the number of commenters, the Advisory Board may limit the length of comments. At previous meetings, comments have been limited to three minutes in length; however, this time may vary. Commenters should address the specific wild horse and burro-related topics listed on the agenda. Speakers are requested to submit a written copy of their statement to the address listed in the ADDRESSES section above or bring a written copy to the meeting. There may be a Webcam present during the entire meeting and individual comments may be recorded. Participation in the Advisory Board meeting is not a prerequisite for submission of written comments. The BLM invites written comments from all interested parties. Your written comments should be specific and explain the reason for any recommendation. The BLM appreciates any and all comments. The BLM considers comments that are either supported by quantitative information or studies or those that include citations to and analysis of applicable laws and regulations to be the most useful and likely to influence BLM’s decisions on the management and protection of wild horses and burros. 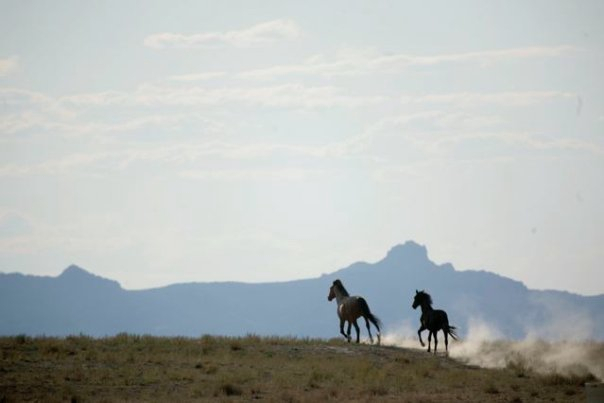 COLORADO SPRINGS, CO. (March 31, 2014) – On March 24, The Cloud Foundation received an anonymous tip that BLM had rounded up and removed 41 free-roaming horses from public lands in northern Wyoming. Further investigation revealed that BLM conducted a helicopter roundup of the horses and turned them over to the Wyoming Livestock Board who sold the horses directly to the Canadian Bouvry Slaughterhouse. The taxpayer-funded roundup was conducted with no notice of sale after the horses were impounded, giving no one the opportunity to step in and negotiate a deal to purchase any of the horses. Even Bighorn County Sheriff, Kenneth Blackburn, was surprised that he received no notification of the roundup, which was conducted in his jurisdiction. The horses were driven to Shelby, Montana, to the Bouvry-owned feedlot, the jumping off point to their Canadian slaughterhouse, the largest slaughterhouse in Canada. On March 18, only eight days after Kathrens last spotted the horses, the BLM Field Office in Cody, WY supervised their roundup and removal. A BLM spokesperson told a Cloud Foundation representative that the horses would be held at the Worland Livestock Auction for 10 days and then sold. However, later investigation revealed that the 41 horses rounded up by Cattoor Livestock Company on March 18-19 were delivered to the Worland Livestock Auction for brand inspection. Just a few hours later, once the brand inspection was completed, 37 horses were loaded onto a truck paid for by the Wyoming Department of Agriculture and hauled to the Canadian border. The history of these horses is debatable. The BLM contends they are not wild, stating that they once belonged to an area rancher who died and his horses have only been in the area for 40 years. However, the Wild Horse and Burro Act (WHB Act) defines a wild horses as an “unclaimed, unbranded horse on federal lands in the United States.” Wyoming brand inspector, Frank Barrett, verified there were no brands of any kind on any of the animals. It is clear that these horses have survived for many years on their own, living in wild family bands, and thriving without human intervention. Conflicting reasons have been given for the timing of this BLM roundup when the horses had newborn foals. BLM indicated that private landowners in the area have complained about horses trespassing on their land. 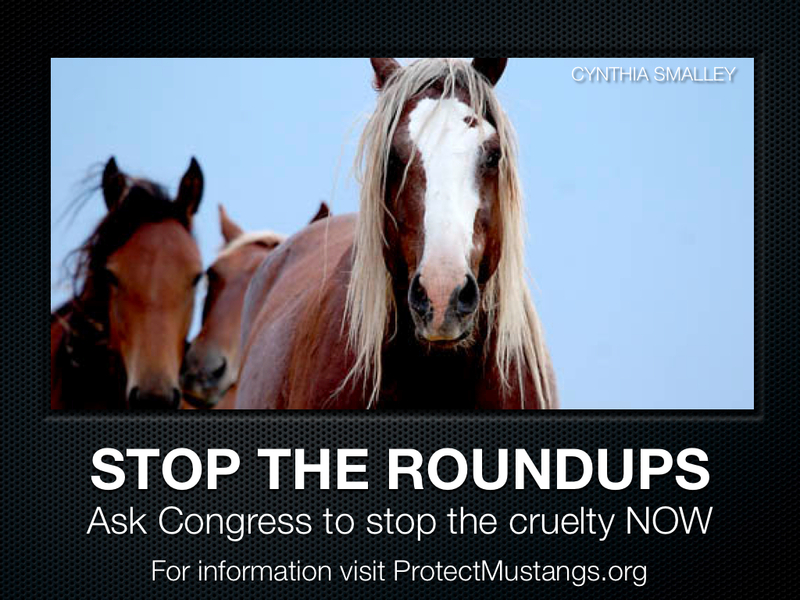 Sarah Beckwith, BLM spokesperson said that the horses were a threat to public safety – vehicles had killed two horses. However, after further investigation, TCF found that a train struck one horse 6-8 years ago, and a private vehicle struck another around 5 years ago. Jack Mononi, Supervisory Rangeland Management Specialist for Cody BLM, told Todd-King that if the Agency did not spend the federal dollars by the end of March, the funds would no longer be available. Kim Michels of Red Lodge, MT, purchased all that appears to have survived of the small herd, four tiny foals born this year. “We will do all we can to see that these babies not only survive but thrive as a fitting legacy to their lost freedom and their families,” said Michels. The foals were rescued by Stacey Newby, co-owner of the Worland Livestock Auction, who fed and cared for the foals, bottle-feeding the tiniest, a 3-week-old filly. The foals are now in the care of equine veterinarian, Lisa Jacobson, in Colorado. (BLM) for a thoughtful approach to this issue. Cover letter 4700 (010.JB) dated November 1.
scientific evidence about effects of current immuno-contraception use. rolling out a similar management plan for the Pryor Mountain wild horses. inherent negative potential for this herd. proteins and wildlife." J Reprod Immunol 83(1-2): 151-7.
following a single inoculation of porcine zonae pellucidae in the domestic equine." (Equus caballus) Extends Reproductive Cycling Beyond the Normal Breeding Season." There is no overpopulation problem despite what the spin Dr.s say. What we find on the range is an underpopulation problem. 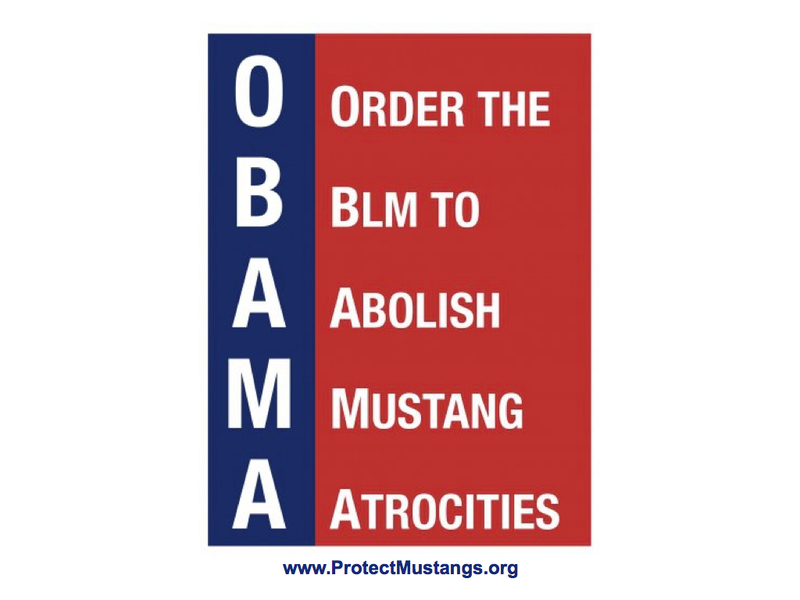 Please order the BLM to abolish mustang atrocities! RENO, NEV. — Wild-horse advocates may be unified in their sharp criticism of Interior Secretary Ken Salazar, but they’re split over President Barack Obama’s choice to replace him. Horse groups are hoping Recreational Equipment Inc. chief Sally Jewell will represent a shift in direction for the government’s management of wild mustangs. They note nearly 40,000 horses have been removed from the range across the West during Salazar’s four-year tenure, which ends in March. Suzanne Roy, director of the American Wild Horse Preservation Campaign, said her group “responded optimistically” to Jewell’s nomination and looks forward to opening a dialogue with her about reforming the U.S. Bureau of Land Management’s wild horse program. In announcing the nomination Wednesday, Obama said Jewell has earned national recognition for her environmental stewardship at REI, which sells clothing and gear for outdoor enthusiasts. He also noted her experience as an engineer in oil fields and her fondness for mountain climbing, biking and skiing. But Anne Novak, executive director of California-based Protect Mustangs, said she has doubts about Jewell because of her earlier background as a commercial banker and Mobil Oil engineer. 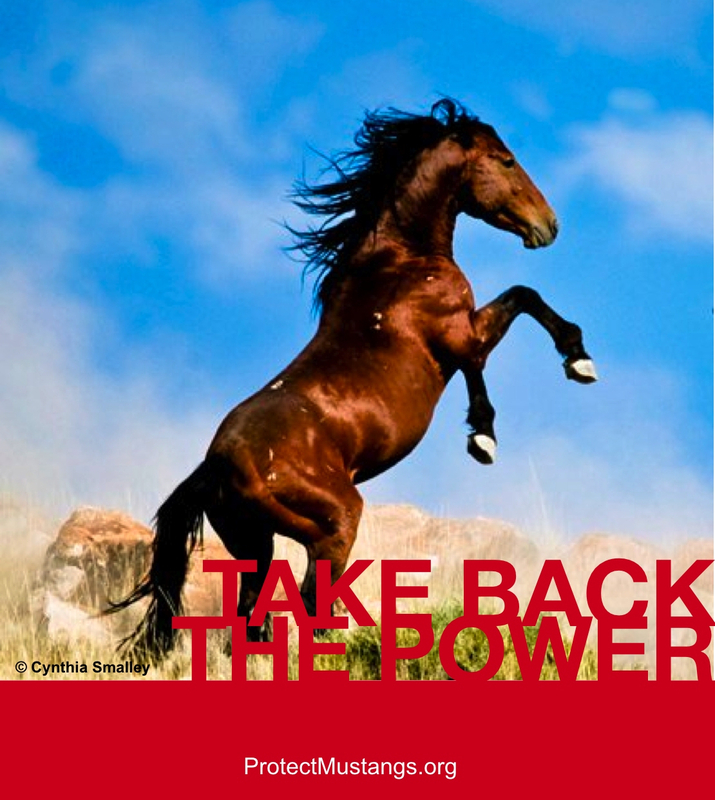 Madeleine Pickens, head of Saving America’s Mustangs and wife of Texas billionaire T. Boone Pickens, said it remains to be seen whether Jewell can bring about real change in the BLM’s management of mustangs. Pickens had endorsed Rep. Raul Grijalva-D-Ariz., as interior secretary, saying he would be the best choice to implement bold reforms. “I don’t know anything about her,” Pickens told The Associated Press on Sunday. “But we’re welcoming the change for sure. And we’re hopeful that she doesn’t start to drink from the same well that everybody has been drinking from in Washington. “After a while, you realize these people are incapable of change whether Republican or Democrat. The animals get left out at every turn. 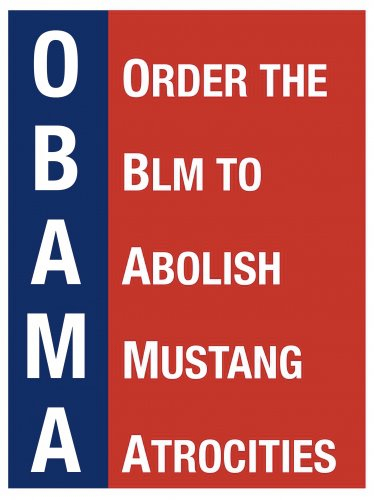 Politically, the mustang has always been treated as less than a desert cockroach,” she added. Horse defenders strongly oppose the BLM’s ongoing program to remove mustangs from public lands, saying there are now more of the animals “stockpiled” in government holding facilities than remain free on the range. Jewell must undergo hearings and win U.S. Senate confirmation to become interior secretary. President-elect Barack Obama formally announced the nomination of Sen. Ken Salazar of Colorado for secretary of the interior. After a couple of weeks of Washington insiders speculating about which people might be selected for two of the nation’s key environmental posts, President-elect Barack Obama today formally announced the nominations of Sen. Ken Salazar of Colorado for secretary of the interior and former Iowa Gov. Tom Vilsack for secretary of agriculture. Just a week ago, Congressmen Mike Thompson (D-California) and Raul Grijalva (D-Arizona) were supposedly on Obama’s “short list” for the secretary of interior. A broad coalition of national fishing and hunting organizations, conservation groups and the Karuk Tribe was supporting the nomination of Thompson, while a coalition of environmentalists and national Latino organizations was backing Grijalva. As it turned out, neither of the two apparently likely candidates was chosen. Obama took a shot at the Bush administration’s environmental polices in explaining his reasons for choosing Salazar. Obama hailed Salazar as a “champion for farmers, ranchers, and rural communities” that will “bring to the Department of Interior an abiding commitment to this land we love.” He also affirmed “that tribal nations have a voice in this administration” with the appointment of Salazar. In accepting the nomination today, Salazar vowed to promote clean energy, protect the country’s public lands and national parks, restore the nation’s rivers and work with Native American communities. The Sierra Club, which didn’t endorse any candidate for the interior post, praised the nominations. Carl Pope, executive director of the Sierra Club, said he was confident that Salazar would promote green energy policies and “undo the damage” of the Bush years. “The Sierra Club is very pleased with the nomination of Ken Salazar to head the Interior Department,” said Pope. “As a Westerner and a rancher, he understands the value of our public lands, parks, and wildlife and has been a vocal critic of the Bush administration’s reckless efforts to sell-off our public lands to Big Oil and other special interests. Senator Salazar has been a leader in protecting places like the Roan Plateau and he has stood up against the Bush’s administration’s dangerous rush to develop oil shale in Colorado and across the West. “Senator Salazar has also been a leading voice in calling for the development of the West’s vast solar, wind, and geothermal resources. He will make sure that we create the good-paying green jobs that will fuel our economic recovery without harming the public lands he will be charged with protecting. Safari Club International (SCI) today also expressed its support for Obama’s choice of Senator Salazar as his administration’s next interior secretary. Senator Salazar is currently a member of the Congressional Sportsmen’s Caucus and has been a consistent pro-sportsman vote since he came to Washington, DC, in 2004. “With this appointment, President-Elect Obama has made the logical choice of an Interior Secretary who understands the sportsmen’s legacy of hunting and conservation on America’s public lands,” according to a statement from SCI. “SCI looks forward to working with Senator Salazar in the Obama Administration to make sure the hunter’s voice is heard on every issue that affects hunting, hunters or science-based wildlife management,” Shepard stated. The Sierra Club also lauded Vilsack’s nomination. “The Sierra Club congratulates Governor Vilsack on his appointment to head the Department of Agriculture,” said Pope. “We look forward to working with him in this new role. With a Secretary Vilsack overseeing the National Forest System and the Conservation Reserve Program, we are optimistic that USDA can once again become a responsible steward of wilderness and vital habitat for wildlife. “I am humbled and honored to be nominated by President-Elect Barack Obama to serve as Secretary of the Interior. “My story in America began more than 400 years ago when my ancestors settled the city of Santa Fe, New Mexico. They named it the City of Holy Faith. “As my family struggled for survival across twelve generations in Colorado and New Mexico, their faith that humanity could achieve the potential given to each human being by our Creator has been the bedrock that has sustained them over those many years. “Today as I stand here, I see their faith shining brightly on Barack Obama. “I know Barack Obama as a champion for change, and I am grateful for his confidence in me. “I look forward to serving as a strong voice in the Administration for the West and the Nation. “As the Nominee to be Secretary of the Interior, I will do all I can to help reduce Americaís dangerous dependence on foreign oil. “I look forward to working directly with President-Elect Obama as an integral part of his team as we take the moon shot on energy independence. “That energy imperative will create jobs here in America, protect our national security, and confront the dangers of global warming. “I look forward to helping build our clean energy economy, modernize our interstate electrical grid, and ensure that we are making wise use of our conventional natural resources, including coal, oil, and natural gas. “I look forward to protecting our national parks, public lands and open spaces, and America’s farm and ranchlands. “I look forward to restoring our Nation’s rivers and working to resolve our water supply challenges. “I look forward to helping to address the challenges faced by our Native American communities across the Nation. “And I look forward to investing in America’s young people by implementing President-Elect Obama’s vision for youth programs across America. “I want to thank, first and foremost, my entire family; especially my wife, Hope, and daughters Melinda and Andrea. Without their courage and unwavering support, I would not be here today. “I want to thank my late father, Henry, and my mother, Emma. As a soldier and a public servant in World War II, they instilled in me the values that enabled me and all of my siblings to achieve the American dream. “I want to thank my seven brothers and sisters and all of my family because they have always inspired me to reach for the stars. “I want to thank the five million people of the state of Colorado who gave me the privilege of serving as their chief law enforcement officer as Attorney General and as their United States Senator. I look forward to serving Colorado, the West, and the Nation, in this new capacity. I will work hard to make you proud. “Finally, I want to thank the Members of the United States Senate for their dedication and friendship. I have been honored and blessed to serve with them, Democrats and Republicans alike. “And to my wonderful staff in the United States Senate: thank you for your loyalty and dedication to excellence. 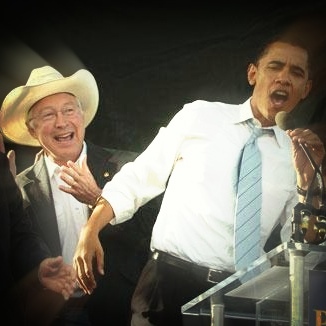 Tucson, Arizona – Strong rumors are circulating that President-elect Barack Obama has selected Sen. Ken Salazar, D-Colo., as the new Secretary of the Interior. As the overseer of the National Park Service, the Bureau of Land Management, the Minerals Management Services, the U.S. Fish and Wildlife Service, and the Endangered Species Act, the Secretary of the Interior is most important position in the protection of America’s lands, waters, and endangered species. 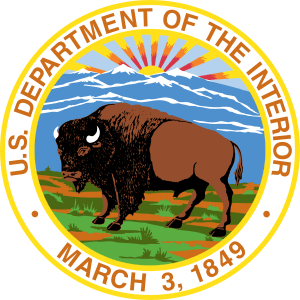 The Department of the Interior has been rocked by scandals during the Bush administration, most revolving around corrupt bureaucrats overturning and squelching agency scientists as they attempted to protect endangered species and natural resources from exploitation by developers, loggers, and oil and gas development. As recently as Monday, the Interior Department Inspector General issued another in a string of reports finding that top Department officials systematically violated laws and regulations in order to avoid or eliminate environmental protections. In addition to his misstep on Norton, Salazar endorsed the elevation of William Myers III to the federal bench. Myers was a former Interior Department Solicitor and lobbyist for the ranching industry. Senator Patrick Leahy, D-Vt., called him ”the most anti-environmental candidate for the bench I have seen in 37 years in the Senate.” Bizarrely, Salazar praised Myers’ “outstanding legal reasoning” regarding endangered species, Indian affairs, federal lands and water, timber, and fish and wildlife issues. The American Bar Association rated Myers as “not qualified.” Salazar later supported Alberto Gonzales for Attorney General, introducing him at his Senate confirmation hearing. Is the Safari Club behind the BIG Oil and Banking CEO of REI being appointed as Secretary of Interior? Interior Department’s Secretary Salazar removes more than 50,000 native wild horses from public land and now Big Oil and Banking’s Sally Jewell, currently CEO for REI, will be appointed to finish the job. Clearly we are witnessing Big Oil and the Banking Industry take over what was set aside for the people. They are zeroing out the indigenous wild horse, living in freedom, in order to industrialize and pillage public land for the extractive industry. Is the Safari Club International behind this appointment? They allegedly support removing environmental protections for hunters yet the extractive industry benefits from clearing away environmental restrictions don’t they? 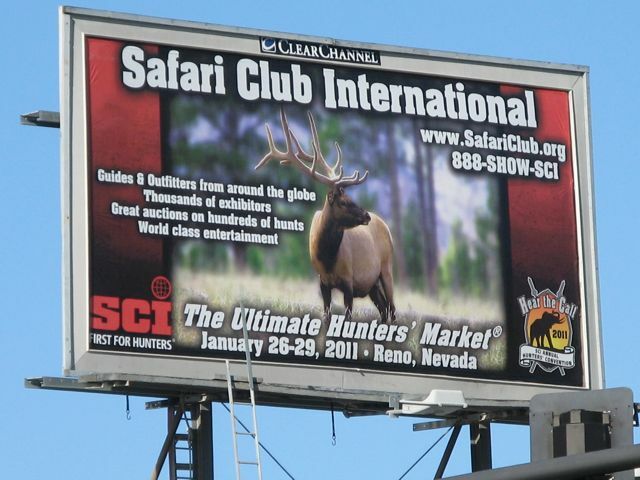 Did you know the Sierra Club is buddies with the Safari Club? They both came out against wild horses and pro-roundups under Secretary Salazar’s reign. Yes, they make strange bedfellows but if you do a little research it all becomes clear . . .
Are we going to sit by and allow this to happen? President Obama on Wednesday will nominate Recreational Equipment (REI) chief executive Sally Jewell to head the Interior Department, according to a White House official who asked not to be identified because the public announcement has not yet been made. The choice of Jewell, who began her career as an engineer for Mobil Oil and worked as a commercial banker before heading a nearly $2 billion outdoors equipment company, represents an unconventional choice for a post usually reserved for career politicians from the West. But while she boasts less public policy experience than other candidates who had been under consideration, Jewell, who will have to be confirmed by the Senate, has earned national recognition for her management skills and support for outdoor recreation and habitat conservation. In 2011 Jewell introduced Obama at the White House conference on “America’s Great Outdoor Initiative,” noting that the $289 billion outdoor-recreation industry supports 6.5 million jobs. Jewell, who is being nominated to succeed Interior Secretary Ken Salazar, would take over at a time when many conservationists are pressing Obama to take bolder action on land conservation. Salazar devoted much of his tenure to both promoting renewable energy on public land and managing the 2010 Gulf of Mexico oil spill. On Tuesday former interior secretary Bruce Babbitt gave a speech at the National Press Club calling on the president to set aside one acre permanently for conservation for every acre he leases for oil and gas development. Facingcongressional opposition and budget constraints during Obama’s first term, Salazar emphasized the importance of enlisting private sector, state and local support to protect major landscapes through America’s Great Outdoors Initiative. Jewell emerged as a strong advocate of the policy, and is likely to continue such efforts. While public lands protection has traditionally enjoyed bipartisan support, this issue has become increasingly polarized, and the 112th Congress was the first one since 1966 to fail to designate a single piece of wilderness. Environmentalists such as Babbitt have urged Obama to use the Antiquities Act, which gives presidents the executive authority to set aside land as national monuments, to protect ecologically valuable areas in the West. While Jewell is more closely identified with the Democratic Party than the Republicans, she made a high-profile appearance with Sen. John McCain(R-Ariz.) back in 2008 when he was running for president. McCain spoke with Jewell and others at an environmental policy roundtable outside of Seattle, during which the senator argued that he had stronger environmental credentials than either Obama or Hillary Rodham Clinton, who were both vying for the Democratic presidential nomination at the time. Other contenders for the Cabinet position in recent weeks included former Washington governor Christine Gregoire (D), Interior Deputy Secretary David Hayes and Sen. Tom Udall (D-N.M.). OBAMA ~ Mustang poster © Lise Stampfli 2009, all rights reserved. On Election Day, at an enthusiastic gathering of Obama supporters in Fountain, Colorado; Dave Philips, a reporter for the Colorado Springs Gazette Telegraph, had just finished an interview with Secretary of the Interior Ken Salazar about his controversial policies for managing America’s wild horse populations. Just after Secretary Salazar answered final questions about the future safety of wild horses and he turned to leave the interview, he unexpectedly approached Phillips and told him, “If you set me up like this again, I’ll punch you out.” Standing nearby was Ginger Kathrens, Executive Director of the Cloud Foundation, a Colorado-based wild horse advocacy organization. “I was stunned by the Secretary’s rude and clearly hostile comment toward Dave,” said Kathrens. Phillips’ interview with Salazar was a follow-up to a story he had written in September about the sale of wild horses to Tom Davis, a Colorado killer buyer who purchased over 1,700 wild horses from government holding facilities. The horses ended up in south Texas and it is believed they were trucked over the border to Mexican slaughterhouses. Secretary Salazar acknowledged that an investigation of Davis’ activities is currently underway. The BLM removes far more horses from their legally designated home ranges than can be adopted out to the public. The massive roundups have resulted in the stockpiling of animals in government facilities and privately contracted ranches. Nearly twice as many wild horses are housed in these costly holding operations than currently roam free, leaving most wild herds under populated and vulnerable to inbreeding and die-off due to a lack of genetic diversity. Call the White House at 202-456-1111 and ask for special interest Cattle Baron and wild horse foe Ken Salazar to be removed from office, TODAY!! Congratulations Mr. President ~ Now let’s save the mustangs!